> Fiserv > The Buried Costs and Hidden Risks of Manual Reconciliation. What's at Stake? Automated processes offer a solution to this risk-laden adventure. 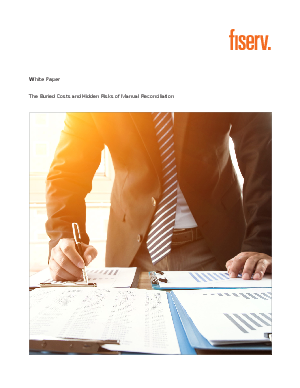 In the white paper, The Buried Costs and Hidden Risks of Manual Reconciliation for Insurers, learn how to calculate and compare the costs of a manual system versus an automated system.